Merci is using Smore newsletters to spread the word online. watch you are about to read is the DRSABC action plan.These steps are very important as they can save the lives of many.Maybe a family member, family friend, close friend or even just a stranger.If you were in a dangerous situation, for example you have passed out, had an allergic reaction to something or you have just been hurt, wouldn't you like to be helped out?..............even by a stranger.If so it would be important for you to help another out by using these 7 easy simple steps. Check for response -ask the patients name. Call triple zero (000) for an ambulance or if for any reason you cant ask another person to make the call for you. 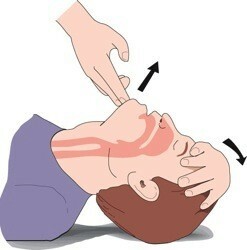 open airway by tilting head with a chin lift. Check for breathing-look, listen and feel. So there are the 7 easy steps to saving a life. Simple huh? I hope you enjoyed enjoyed reading this and I'm sure you'll need this steps later on in a major emergency. Share these steps with others. Especially those you care about and maybe even your life could be saved by the hero who were taught this 7 simple steps! Thank you for reading.